Paying the Price for Playing like Messi? I have written this post as a reminder as to why I purchased Paulo Dybala, as in the past I have been far too quick to lose focus and sell my portfolio. Every single player is in my portfolio for a reason, I have specific goals set for each player I own. This is the same for Dybala, I know what I expect him to achieve, but I also have a final end result in mind. For Example, I have Weigl, midfielder for Dortmund. Purchase price = £0.80, current value £1.04. This is a good profit flip, except for the fact I am not holding him for a flip. I believe his end goal is Premier League, or at very least Bayern Munich, as there aren’t many Germans in the Premier League. This is a similar story with Dybala, except I don’t hold him for his potential, as I believe he’s at the Top Level already. I own him purely for sweeping up dividends in Serie A, he has a fantastic goalscoring record, and Performance Buzz records to show for this, with over £0.40 in dividends already. I don’t believe he will increase much more in price, as he’s around the Griezmann level (they are the two next in line from Messi / Ronaldo). I don’t expect Dybala to get much in terms of Media Dividends, nor do I expect him to make the World Cup squad. Not due to Ability, due to sheer competition. Argentina always rely on their experience, although Dybala has won many titles with Juventus, I feel that Messi, Higuain, Aguero, Di Maria, Lautaro offer great competition, so I won’t be surprised to see him cruelly left out of the squad. He hasn’t been match fit for most of 2018, just returning in March. We really will have to wait and see who Argentina pick, I only wish England had such headaches! Instead, we have to decide which numpty we want in goal! To Reiterate, this post isn’t to persuade you to buy Dybala, I am trying a new avenue to ‘detail’ my trades & my reasons why I have picked certain players for my portfolio. Let me know what you think of Dybala on Twitter or in the comments! It’s very likely that Dybala won’t make the Argentina squad. There seems to be a political agenda in the Argentina squad, with the Argentinian Government actually being accused of corruption (By the brother of Paulo Dybala). On Paper, Argentina have Sergio Aguero, Lionel Messi, Gonzalo Higuain, Mauro Icardi, Angel Di Maria, Manuel Lanzini, Paulo Dybala all competing for the same spots. Now, we all probably know that Dybala is better than most of the above, bar Lionel Messi, but with International Squads it all comes down to systems that are played. Lionel Messi is the man who operates in the same role as Dybala would, dropping deep to kickstart play, before getting inside the box to finish the attack. Argentina don’t need two players doing the same role, a player such as Higuain or Aguero would be operating as a sole forward, sitting on a defender, allowing Messi even more space. Dybala isn’t a target man, so I believe he will struggle to get in this squad. Messi isn’t going to be dropped, especially as it’s potentially his last world cup with Argentina. Undoubtedly, there are going to be many traders who will have purchased Dybala, hoping he can do for Argentina what he does for Juventus (Very High PB Scores). I believe this has the potential to cause a crash, although traders should not be worried, even if Dybala fails to make the World Cup squad. How Can I not worry? I wanted World Cup Dividends! The prospect of the World Cup is great, but let’s break it down. This is based on my World Cup Predictions. If you hold Paulo Dybala for Performance Buzz, below is the MAXIMUM you can hope to achieve. If he was to outscore Messi! Best Case Scenario. Dybala lands £0.04 in every Group Game, totalling £0.12. He then earns £0.08 in the Round of 16 & Quarter Finals, followed by £0.12 in the Semi Finals & in the final. This totals to £0.52, but would basically require Argentina to Win the World Cup & Dybala to get Golden Boot. With Bookmakers, Dybala is 34/1 to win Golden Boot, Argentina 10/1 to Win the World Cup, so I would advise investing in this instead! I called the above the best case scenario. It’s highly unlikely, it’s going to be easier to win a 10 Team Accumulator! 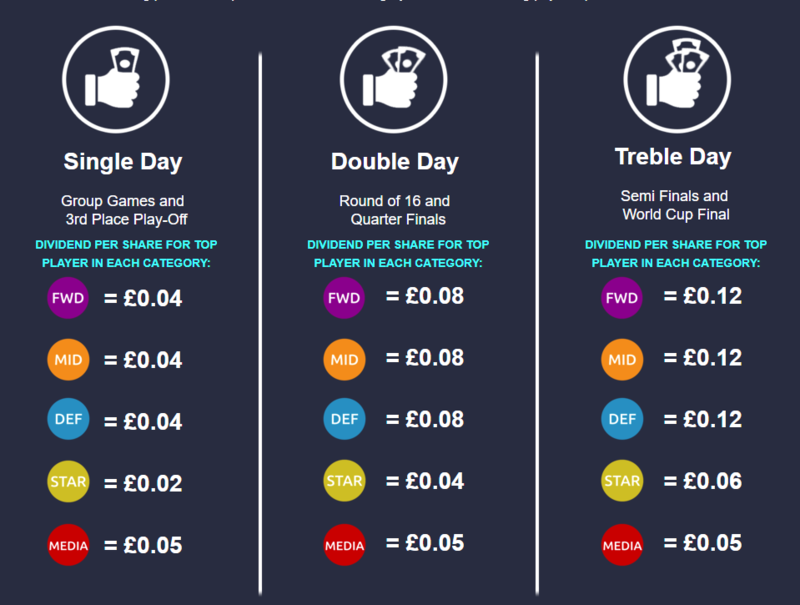 The World Cup Final is the day where a player can realistically earn £0.23 in a single day, as the Cup winning goalscorer HAS to scoop Media Buzz… surely? There isn’t much need to stress over World Cup dividends, normally it’s the transfer window during this period, so just treat it as ‘extra payouts’. Dybala definitely has the ability to hit a Performance Buzz streak with Juventus, as he consistently scores well. There is likely to be daily re-shuffling of portfolios for beginner traders and flippers. This is more likely to occur from the Round of 16 & Quarter Finals, up until the full time whistle of the World Cup Final. This is due to the reduced player pool from the Round of 16 and onwards, less competition and increased payouts. The most advanced traders had their World Cup portfolio in order before Christmas. I will be honest, I wasn’t that quick to decide my portfolio. I am treating the World Cup dividends as a bonus, I am holding players who offer value both for the World Cup, aswell as the Summer. This is to try and negate any Crashes if a National Side gets knocked out of the World Cup.